We talk to the everyday heroes who make Singapore a better place person by person, day after day. These LGBT support groups will also have a booth (or a picnic mat) at Pink Dot 2011, so come by and say hi! Who They Are:A group that fosters understanding and support between the straight and queer communities that was set up in May 2008 by Sam Ho, Jean Chong and Jennifer Teo. What They Do: Provide a space and network for like-minded and LGBT-supportive people to share their views. The Singapore Queer-Straight Alliance (SinQSA) is a forum to express support for equality regardless of sexual and gender orientation. Conversations happen a lot online, through their facebook page, where members freely share their thoughts on queer-straight unity and harmony with like-minded folks. We catch up with Sam Ho after his trip back from abroad to share more about SinQSA! What inspired the creation of SinQSA? The idea of a gay-straight alliance was shared during an informal meet-up at Food #03 in May 2008, commemorating IDAHO (the International Day Against Homophobia). 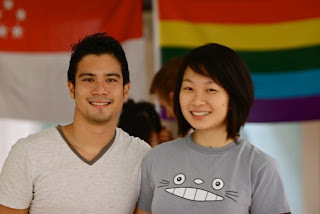 Shortly after that, Jean Chong, Jennifer Teo and I got together and started The Singapore Queer-Straight Alliance (SinQSA), which uses the “queer” instead of “gay” because the former encompasses a wider spectrum of gender and sexual identities. What do you hope to achieve from the creation of SinQSA? SinQSA hope to serve as a platform for LGBT-affirming persons to share or express their support for equality regardless of difference. It is the aspiration that every individual in Singapore can see that there isn’t a big deal about being friends or respecting another person who is of a different orientation or persuasion than them – that constitutes an alliance for us. As with traditional gay-straight or queer-straight alliances, I do my best to capture the spirit of SinQSA and stand up against homophobic or transphobic abuse, and also stand up for gay-affirming straight persons. I see SinQSA more of an idea or a pledge, rather than a group at the moment. In your opinion, do you feel that queer-straight harmony has improved? How do you hope to encourage Singaporeans to adopt queer-straight harmony? I used to be very angry with homophobic people, but with SinQSA and the people I have met, I have learned it is more important to create dialogue and let homophobic individuals see the implications of their words and attitude. If we put them down for what they say or believe, I guess we are only as bad as they are, no? If people are spending so much time and effort just to create poles and camps and to draw boundaries and territories, I think some amount of time and energy can be devoted to bridging the gaps that exist in between. One baby step towards an ideal or an aspiration is better than just thinking about the ideal or making the aspiration. What will you be wearing to Pink Dot this year? I haven’t been to the last couple of Pink Dots, so I am deciding between a plain pink t-shirt or a red shirt that reads “I’m think he’s gay” with an arrow pointing to the left.